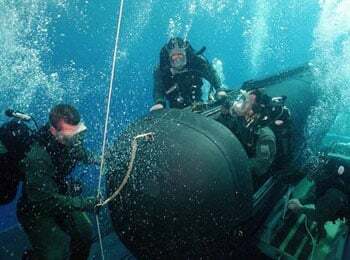 The US Navy's Stingray-esque SSGN underwater special-forces motherships have seen good news and bad news in recent days. SSGNs* are heavily modified Ohio class ballistic-missile boats, retired from their old duties under the terms of nuclear-weapons limitation treaties. The nuclear-propelled subs have been stripped of their Trident ICBMs, and will now carry up to 154 "Tomahawk" cruise missiles with conventional warheads, able to attack targets accurately hundreds of miles inland. In addition to this huge bombardment arsenal, the SSGNs have accomodation for 66 special-forces frogmen, or as many as 102 for shorter periods. There will normally be a "dry hangar," too; that is, a docking bay for mini-subs which can carry the frogmen (Navy SEALs, or perhaps MARSOC Marines) about their business. In future, such vessels may also deploy underwater robot platforms such as the Talisman. According to the commander of US submarine forces, an SSGN lurking off a hostile coast "will be able to control a Special Forces campaign over a period of months from her covert position." 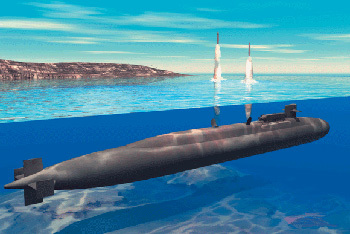 Even nations with fairly capable air forces and navies will be unlikely even to detect the elite American underwater force operating from their hidden mothership - at least until they start cutting loose with Tomahawks. There isn't much doubt about which hostile shores are in question. The US Navy has recently begun preparations to operate SSGNs from its base at Diego Garcia, the British-controlled Indian Ocean island. This would place the American Marineville within easy reach of the Horn of Africa, the Gulf, and of course the south coast of Iran. The SSGN conversion programme has recently passed an important milestone, as USS Florida fired the "first Tomahawk launches from the new SSGN Class" at a test range in the Gulf of Mexico, according to a Navy release last week. Even as the champagne came out at the SSGN programme offices, however, there was bad news from another quarter regarding the so-called Advanced SEAL Delivery System (ASDS). The old-school arrangement for sending frogmen inshore from submarines involves sending them out from the mother ship's docking bay in SEAL Delivery Vehicles (SDVs). These mini-subs don't protect their passengers from the surrounding water, which limits the underwater warriors' endurance. The ASDS was supposed to sort this out, being an enclosed mini-sub with a dry cabin and airlock which would travel into battle docked with the SSGN mothership. But the ASDS procurement programme has been a right old mess, according to a Government Accountability Office report. Curiously, the triumphant missile-test release came out the same day as the GAO slating; of course, only a cynic would see any hint of news management there (though the missile tests had actually completed seven days previously). In any case, the GAO beancounters say the ASDS programme has taken 13 years, cost $885m, and to date delivered just one mini-sub which has "significant reliability and performance issues". To put this in perspective, a single battery-powered ASDS has thus cost as much as three F-22 Raptor stealth superfighters - and it doesn't even work properly. Not least among its defects is that the mini-sub's hydroplanes and propulsion tend to get torn off by slipstream when it is mated to a mothership going fast: at present, an SSGN with the ASDS docked has to restrict its speed. Troy Tempest certainly wouldn't be willing to put up with this sort of thing while battling the Aquaphibians, we submit. The plan is now for a decision on ASDS's future in 2008. However, even without the luxury mini-sub, the new SSGN flotilla will soon be able to cause a lot of disquiet around the shores of the Arabian Sea.